Midtown South Community Council supports "Laundry For Kids"
In New York City, 1 in 7 public school students will be homeless during elementary school. That is more than 140,000 children in the past six years. District 2 of the New York City Public Schools System has over 200 elementary school children temporarily housed in shelters and hotels that do not have laundry services. All across the country, clean clothes have proven to reduce absenteeism and stigmatism of students living in poverty. View Laundry For Kids Proposal's short, mid, and long term solutions on Google Docs here . View Homeless and Housing Study on Google Docs here . View additional information from Midtown South Community Council's video library here . Every child needs to go to school confident and ready to learn. You can help make that happen. We are reaching out to you in hopes that you will join the effort. Midtown South Community Council is committed to helping these children. With as little as $12 you can cover the cost of one large load of laundry. All donations received will be used to purchase laundry certificates at participating laundromats in midtown Manhattan and or the certificates will be given to families in need. Immediate funding is needed for laundry facility certificates for short term solutions. We hope that you will donate to Laundry for Kids! Thank you for your generous donations to Laundry for Kids! Your support has helped over one hundred homeless families clean their children’s laundry. Because of you, homeless children in ten schools were able to start their day confident and ready to learn. The Laundry for Kids program is helping families in several Manhattan shelters that do not have access to free washers and dryers. We ask that you continue to keep these children in your thoughts as you make end of the year charitable contributions. As you may know, chronic absenteeism is the leading cause of students underachieving in school. We believe that every child should have the opportunity to achieve and having clean clothes has proven to boost attendance rates. While we may not be able to solve the homeless crisis, helping students clean their laundry is something we can do. We have reached 99 kids since this program began! In addition to the Laundry for Kids program, we are working with City Council and the Department of Education for long-term solutions to this issue. In the meantime, we hope that you will continue to support Laundry for Kids and help end the stigmatism of homeless children. 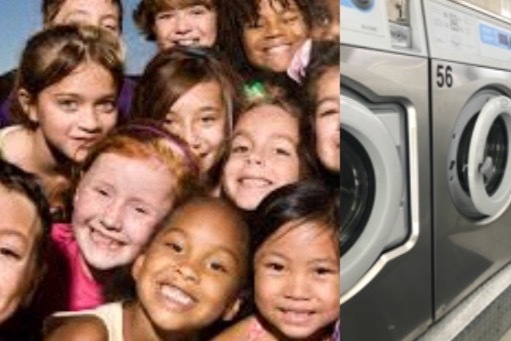 I paid for 15 more children to have their laundry washed. I am sure they were getting ready for that first day of school. The gift cards are being tracked. We're hoping to get some testimonials later in the school year. We're working on a temporary space for laundry services so they can wash and attend workshops simultaneously. And we're pushing NYCHA to give us a large space to do add multi commercial washers and dryers to service shelters, NYCHA residents, and other public! Your participation and support warms the heart! Thank you so much for your contribution! We want you to know what your gift of giving is doing for the children who are suffering from homelessness. So far we’ve raised a little over $3,000.00, and thanks to you and everyones generosity, we’re nearing our goals! Your donation helped give twenty-six families some relief prior to the recent summer break, and will give the children a great start for the coming school year! No one should have to make a decision between laundry service and putting food in their tummies. The kindness you’ve shown is very appreciated and will go a long way! This an important issue for the Midtown South Community Council and Homeless and Housing committee. We’ve been very busy since posting our Laundry for Kids campaign, talking with people about installations of laundry machines, looking for temporary and permanent spaces, and planning for workshops too. Please join us at our Midtown South Community Meetings or Homeless and Housing meetings. Your participation will be most welcomed!